Hand mixers are a must have item for any kitchen. This cheap hand-held appliance can handle many tasks like whipping, mixing, and mashing. Where they differ is when they have to tackle a thick batter like cookie dough. To find that perfect model it must have plenty of power – as measured in watts, numerous speeds and different attachments to handle whatever food you are preparing. It is also nice if they are lightweight, easy to use with simple buttons, easy to clean, and one that does not splatter ingredients by starting out at too high of a speed. The cost for buying a new hand mixer will range from about $15 to over $100. Ones that can truly handle cookie dough with ease tend to be about $45 and up. Below you can find reviews for the top 5 best hand mixers. We selected the KitchenAid KHM926 as the best hand mixer which is priced from around $72 and up depending on which color option you choose. This model has plenty of power from its DC motor and 9 speeds to mix anything you want including dense ingredients like dough. It also has a Soft Start feature that brings the beaters up to speed gradually to help prevent splattering. The KHM926 comes with a set of beaters, a pro whisk, 2 dough hooks and a blending rod. 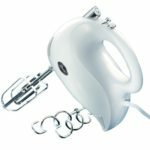 Overall you can’t go wrong with this hand mixer, but there are cheaper options. Another top choice on this list is the $67 Cuisinart HM-90BCS. 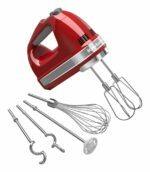 This 9-speed model has 3 low start speeds to prevent splattering and comes with beaters, dough hooks, whisk, and spatula which all fit inside the included storage case. The overall performance is excellent and the 220 watt motor provides enough power to handle heavy batters. One minor complaint is that it is a bit noisy, but that does not take away from the fact that the Cuisinart HM-90BCS is a great hand mixer. The $55 KitchenAid KHM7210 will save you a bit of money over the KHM926. This model has 7 speeds with a the Soft Start feature that brings the beaters up to speed gradually. It comes with 2 beaters and 1 whisk, but no storage case. Overall the KitchenAid KHM7210 has excellent performance and we would not hesitate to recommend it. 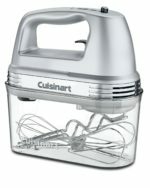 The Cuisinart HM-50 hand mixer has a price of around $38. It received the highest score and is recommended by the leading consumer magazine. The HM-50 has plenty of power and solid mixing capabilities, but only has 5 speeds. The only attachment it comes with is the standard set of beaters, there is no dough hooks or whisk. 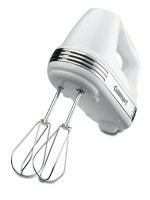 Overall this Cuisinart model is great for people who need a quality mixer, but do not need any extra attachments. If you want more features or more speeds then you will need to consider spending more money. If you want a cheap hand mixer then you should consider the Oster 2500 Inspire which sells for just $16. Its performance won’t wow you, but it gets the job done – even when kneading dough. It comes with a set of beaters and dough hooks. The biggest complaint from users is that it does not stand up when you sit it down, it tends to tip over easily. The manufacturer says it is designed to just rest on its side when you not in use.